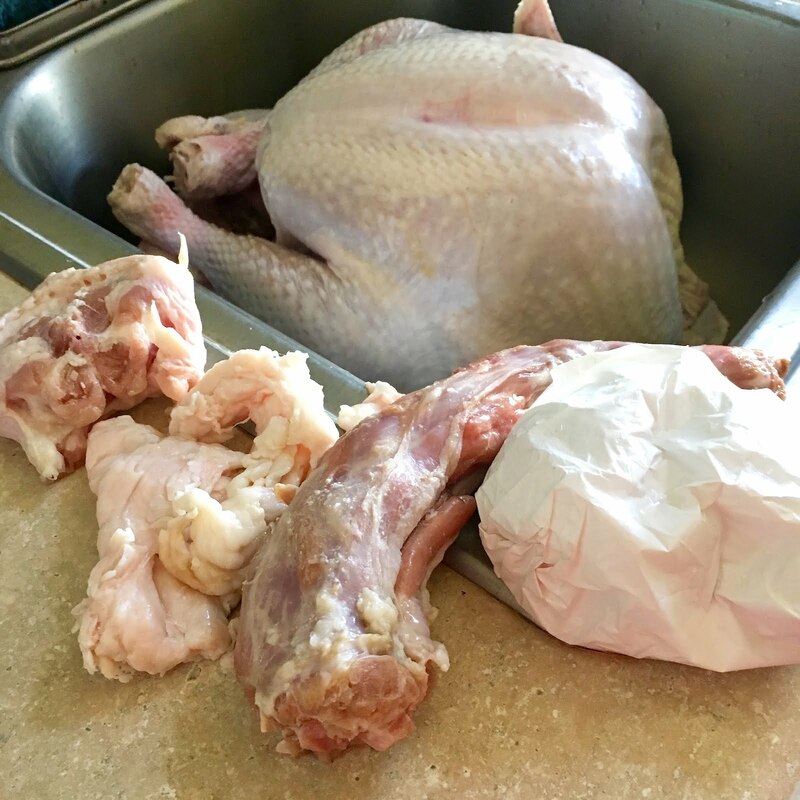 Once it is thawed, whether you are brining or not, you will need to remove everything from the cavity. This is what you will find inside your store-bought bird, including that plastic package. Make sure you get everything out before brining and cooking! 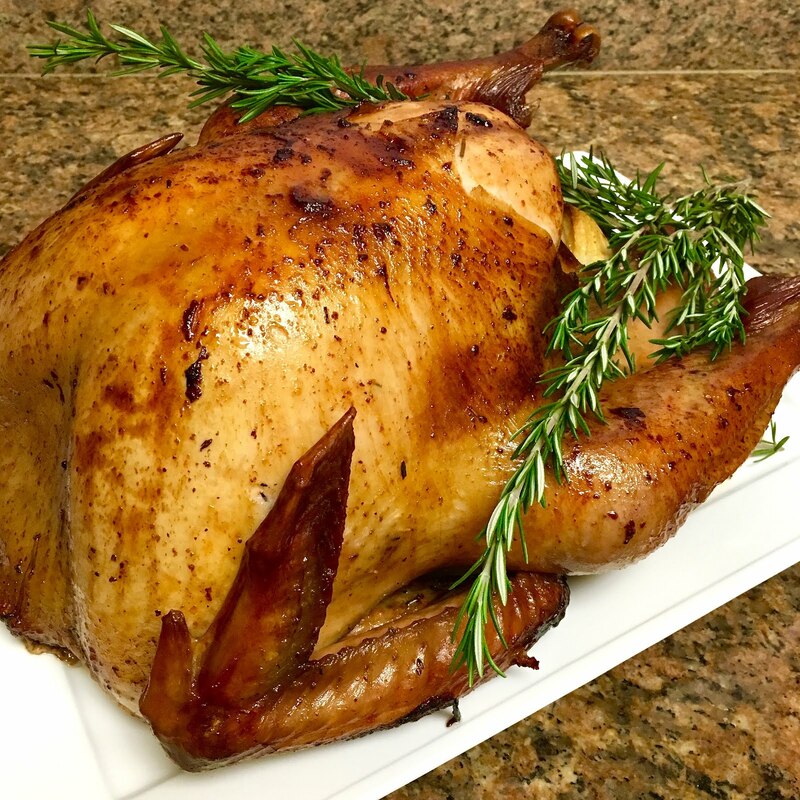 Brine your turkey for the most juicy and flavorful bird ever! 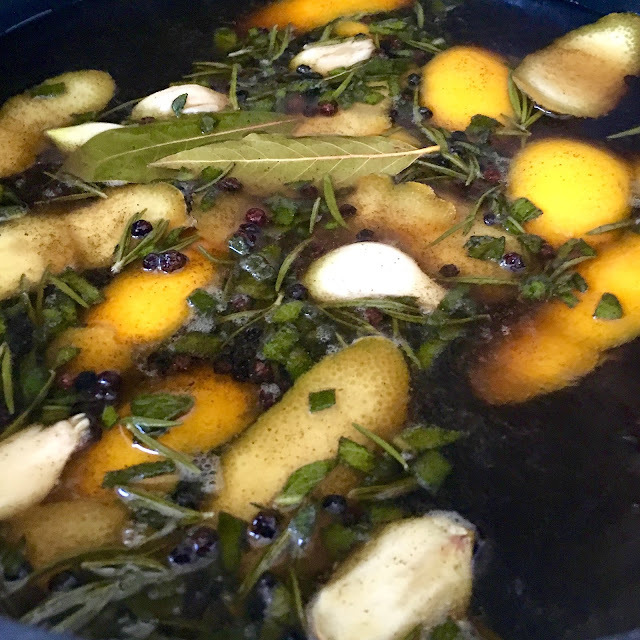 I like to make the brine on Tuesday night to allow it to cool in the fridge overnight, and then brine the turkey the day before Thanksgiving, on Wednesday, so it can soak from Wednesday morning to Thursday morning. 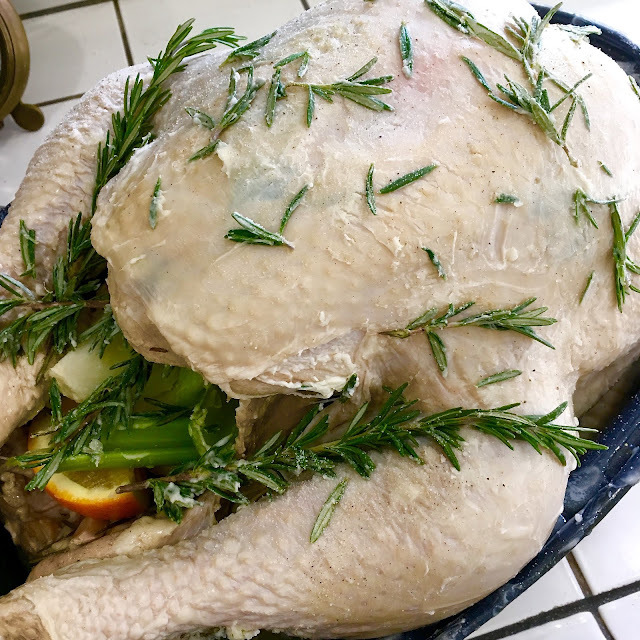 By letting the turkey sit, submerged in a brine, it will be able to absorb the moisture and flavorings that can be lost during the roasting process. 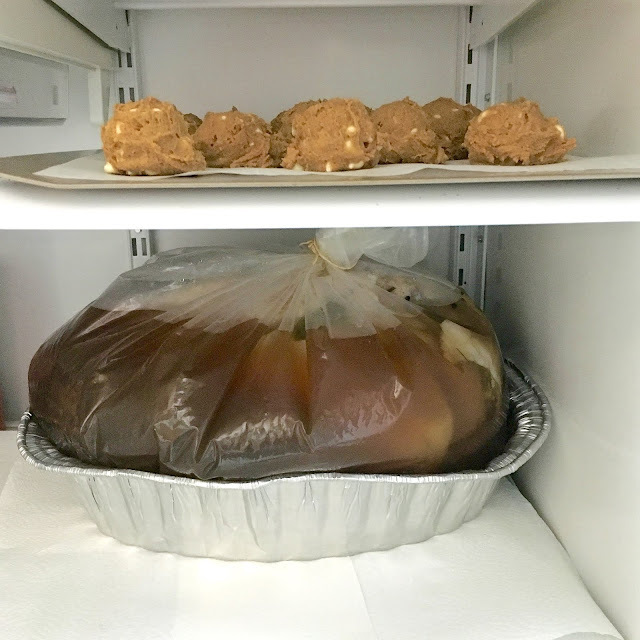 Brining is usually done for 1 hour per pound but as long as you get it in the brining solution and in the fridge to brine overnight, that will do the trick. Position oven rack to the bottom third of the oven and preheat the oven to 450°F. Remove your bird from the fridge. 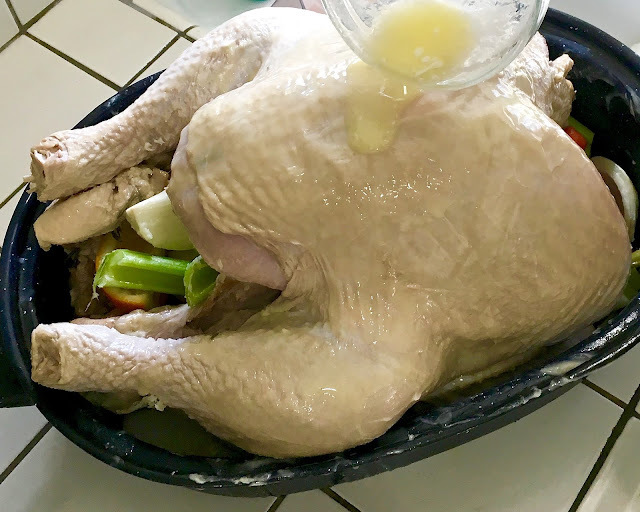 Rinse the outside and inside of your thawed turkey before cooking, so it is not too salty from the brine. Pat dry and let sit on the counter for about 30 minutes, so it is not cold out of the fridge when you put it in the oven, so it cooks more evenly. 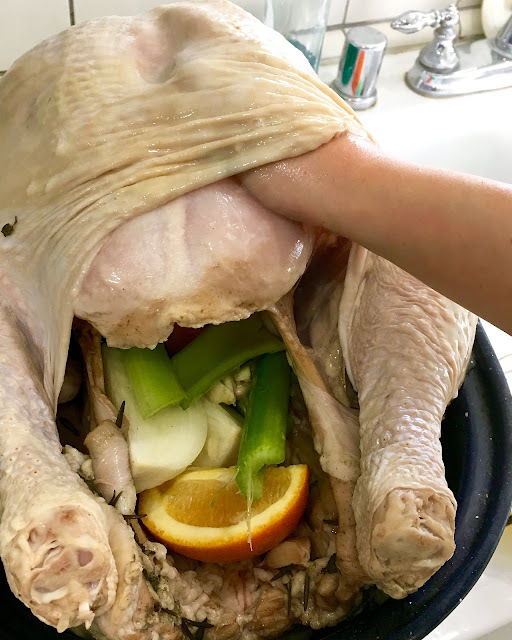 Season the inside of the cavity with salt and stuff it with aromatics like an onion, garlic, orange peel, celery, carrot, rosemary sprigs, etc., NOT stuffing. 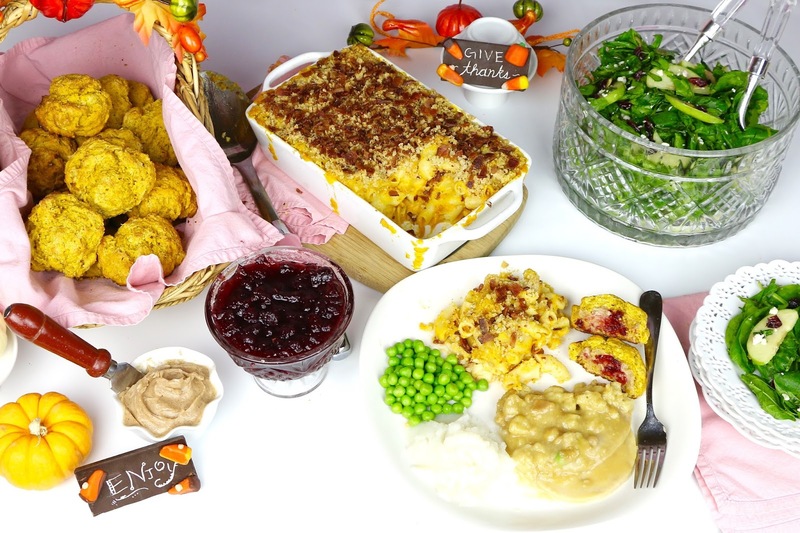 (Make the stuffing separate). 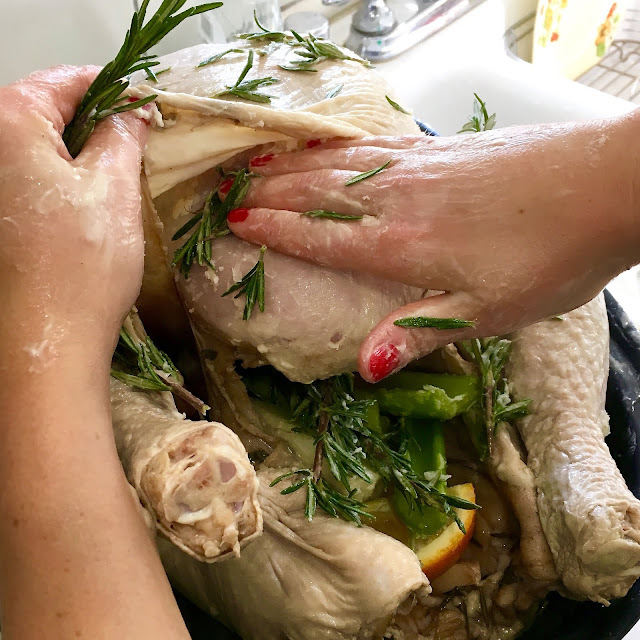 Tuck the wings underneath the bird and brush the skin of turkey all over with vegetable oil or melted butter, to ensure a perfectly browned and crispy skin and season the skin of the turkey with salt pepper and rosemary, or any seasonings you choose, for extra flavor. Stick a few pads of butter under the skin and under the wings too. This will ensure the birs stays nice and moist during roasting since we won't be basting it. 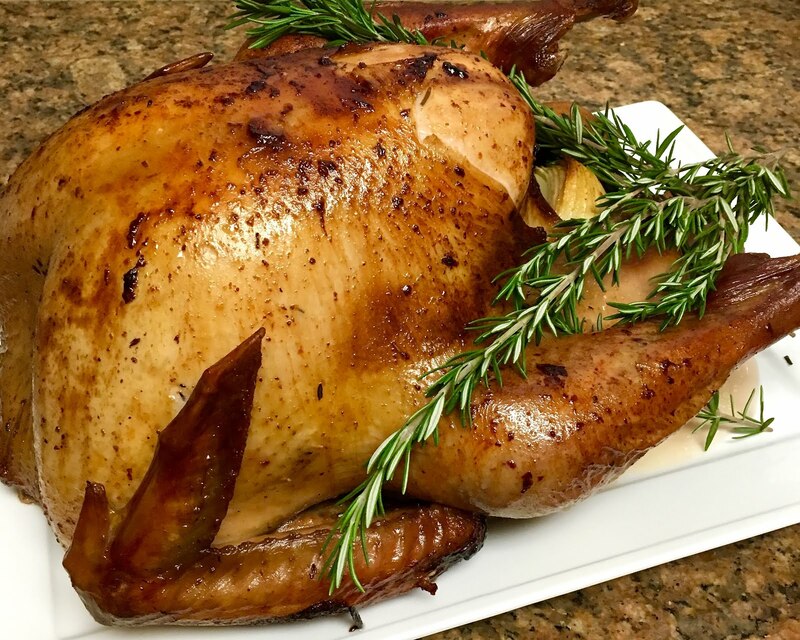 Start high and cook for 30 minutes at 450°F for a perfectly juicy and golden bird. Turn down the oven heat to 325°F for the rest of the cook time. 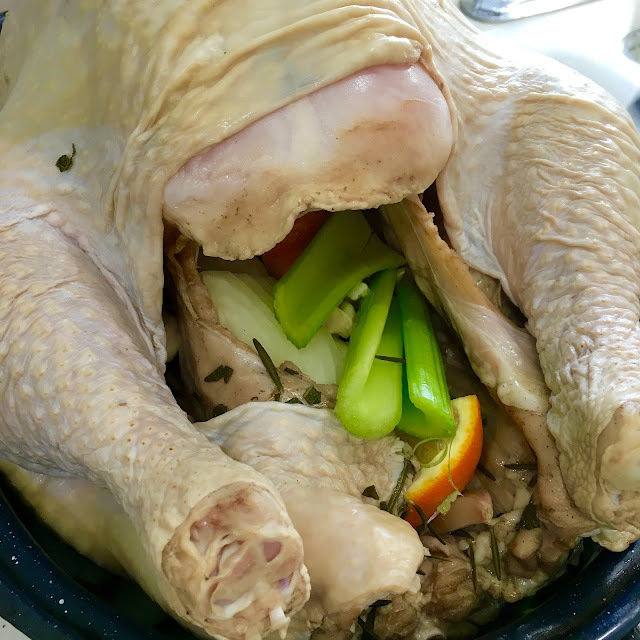 The rule of thumb for cooking a turkey is 13-15 minutes per pound, so my 20lb bird usually takes 4 1/2-5 hours, plus a half hour of rest time. 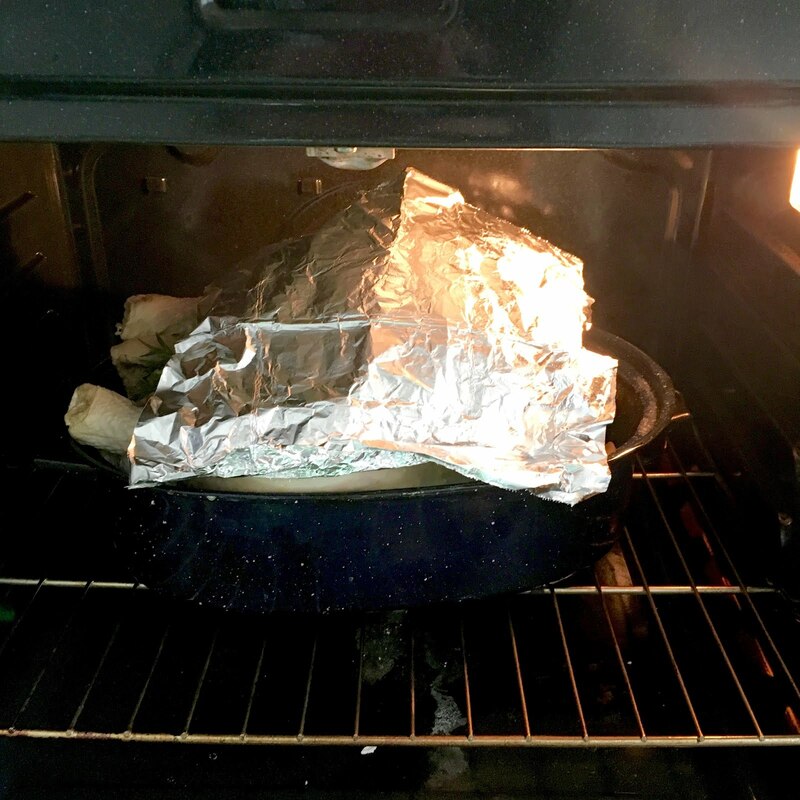 When the turkey is about half way done cooking, or when it looks like it is getting dark on top, loosely cover the top surface of the bird with foil to prevent further browning or over cooking. 6. To Baste or not to Baste? 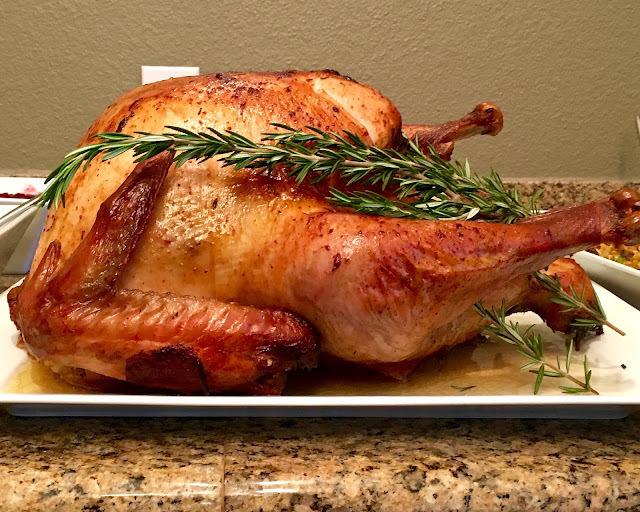 If you have a smaller bird, you can remove the turkey from the oven every 45 minutes, close the oven door so you don't let the heat out, and baste the turkey with the liquid from the bottom of the pan, and then return it to the oven. If your bird if larger, skip the basting... I know, this probably goes against everything you were taught, however studies have shown that basting lets too much heat escape every time you open the oven door, making cooking time take longer, yielding a drier turkey! So, keeping it moist with the brining process and rubbing butter underneath the skin with butter, will work much better at kepping your bird nice and jiucy... Trust me, I basted every single year, and the one year I stopped basting, my turkey cooked so much quicker and was so much juicier and just as flavorful and deliscious... so my vote? YOU DON'T NEED TO BASTE! About an hour before you expect it to be done, use a meat thermometer to check for doneness. It should read 165°F inserted in the thickest part of the turkey around the thigh, when it has finished cooking. The turkey will continue to cook as it rests, so make sure to not let it cook past 165°F while still in the oven. To lock in the juices, rest the turkey on a cutting board by tenting it loosely with foil, and letting it sit for at least 30 minutes before carving, so all the juices can have a chance to lock in and the meat can relax, so it is nice and juicy and tender when you cut into it. Pour your turkey drippings into a measuring cup and let the fat rise to the top, so you can separate the fat from the juice. Skim off the fat into a separate bowl, with a spoon. Measure out the remaining liquid and add enough chicken stock or water to equal 4 cups. Add 1/4 cup of the fat back into the roasting pan over medium heat. Add 1/4 cup of flour, whisking constantly until smooth and thick and golden brown, about 3-5 minutes Gradually whisk in 3 cups of your broth. 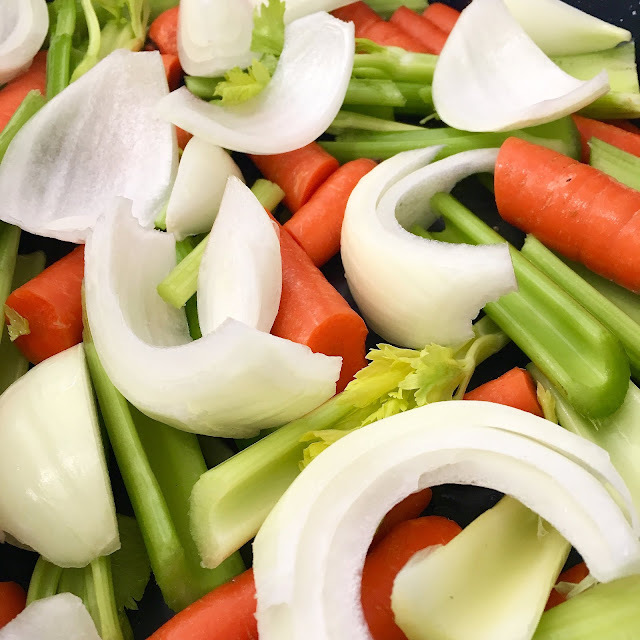 Bring to a boil, reduce heat to low and cook about 5-10 minutes, whisking until thickened, adding more of your liquid until you have reached your desired consistency. If desired, strain gravy through a fine-mesh sieve. for extra smooth gravy. 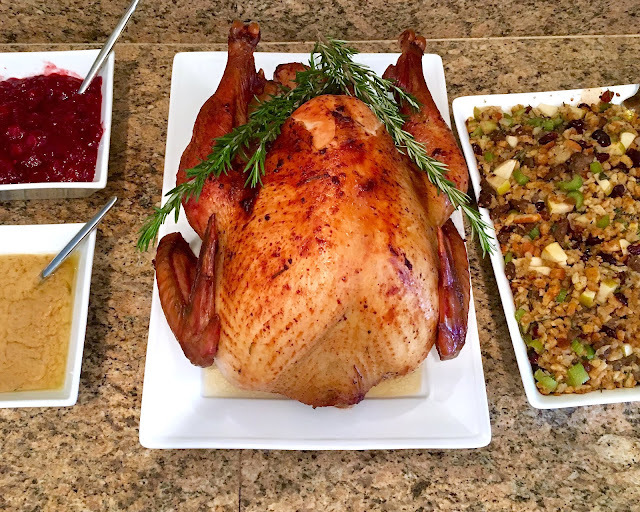 Carve turkey on a cutting board with a baking pan underneath to catch the drippings, serve with gravy and all the fixin's, sit back, give thanks and enjoy! CLICK HERE FOR ALL OF MY THANKSGIVING RECIPES!